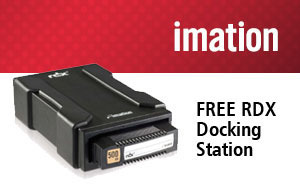 Imation RDX FREE Docking Station Promotion Extended through December 31, 2012 - Get a FREE Imation RDX Docking Station with purchase of Imation RDX cartridges! For a limited time, BackupWorks and Imation make it easy to get a FREE RDX USB 3.0 external docking station. Buy Imation RDX removable Disk Cartridges and we'll give you the Imation RDX USB 3.0 Docking Station absolutely FREE! Hurry, this offer only lasts until December 31, 2012. Q: What is the BackupWorks Imation RDX Promotion (November 28, 2012 - December 31, 2012)? A: Purchase the following Imation Disk Cartridges and receive a FREE Imation RDX External USB 3.0 Docking Station. A: The Promotion is effective from 12:01am, PST, November 28, 2012 until 11:59pm, PST, December 31, 2012. ALL ORDERS MUST BE PLACED BY December 31, 2012. NO EXCEPTIONS.